Good Guys – Poet Patrick Kavanagh Writes “In Memory of My Mother” | It's the Women, Not the Men! Despite what radical, second-wave feminism espouses, a woman can have no more lasting effect on the future, than through her children. She can have no more illustrious legacy than the one she leaves in the hearts and minds of her children. 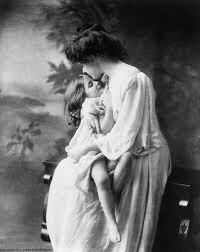 And, she can have no more immortal love than that which is seen through her children’s eyes. Do not be deceived – through the love of a good Christian man (who is the product of a good Christian mother) – motherhood is truly the highest, and most rewarding, calling a woman can aspire to. Contrary to radical, second-wave feminism’s assertions, a woman can undertake no more influential role on earth, than that of a loving mother. And this is because, unlike an employer, her children and grandchildren will never forget her influence on their lives and they will continue to love, and recall, her, well beyond her death. Do not deny yourself the experience of becoming a happily married Christian mother, while wasting your short life in pursuit of a pointless feminist lifestyle, based on an irrelevant “career” because I can assure you, it will end badly. Instead, follow the path to a Christian marriage, and motherhood. The path that God has intended for you all along. Only then will you find the legacy of love, joy and happiness that He has planned for you. You, and your children, deserve no less. Irish poet Patrick Kavanagh expresses this legacy (the one that a loving Christian mother leaves to her children) in the following poem.